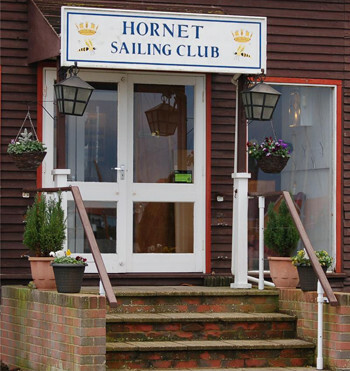 The clubhouse of Hornet Services Sailing Club was the original wardroom for HMS Hornet during WWII. HMS Hornet was one of the key bases supporting the Royal Navy’s Coastal Forces from 1940 until the defence cuts of 1956 when it was determined that Coastal Forces were no longer required and it was de-commissioned. In 1964 Naval personnel in local establishments were granted permission to keep their yachts on the old Coastal Force moorings. 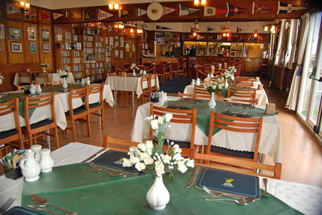 These founding members of the Club repaired the old wardroom and brought it back into use as the clubhouse, serving basic fare, but acting as the heart of the newly formed club. During the last few years the clubhouse and its facilities have undergone a programme of refurbishment, which continues today. The Galley has been refitted to a modern standard and the outer fabric of the building repaired, ensuring another 30–40 years service. 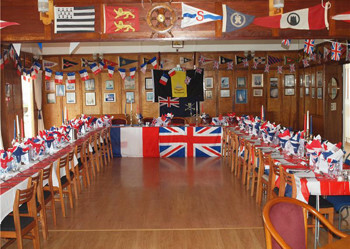 The clubhouse provides a friendly meeting place for all those using HSSC. Members of the Armed Forces and the Reserves, sailing in Hornet-based or visiting boats and those attending JSASTC courses are most welcome. The club bar and restaurant is open most days and the opening times are shown opposite. The club social team run a full programme of formal and informal social events throughout the year; the programme can be viewed on the events page. In addition to the scheduled programme, the bar, restaurant and other clubrooms can be booked for private functions, such as weddings, christenings, wakes and birthday parties. The Fabrosa room is also available for business meetings, and presentations. Members of the Armed Forces or the Reserves, requiring a venue for an all ranks event, are most welcome. meetings for up to 10. The contact point for booking club facilities is the Club Secretary. 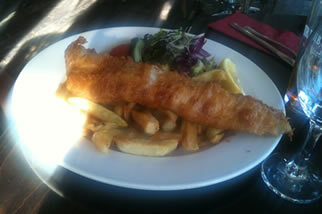 In addition, tables can be booked for any lunchtime or evening, when the club is open. What else is available in the clubhouse? Tea & Coffee available from a machine even when the bar/restaurant are closed. An exchange library (20p a book). We look forward to welcoming you in the clubhouse.